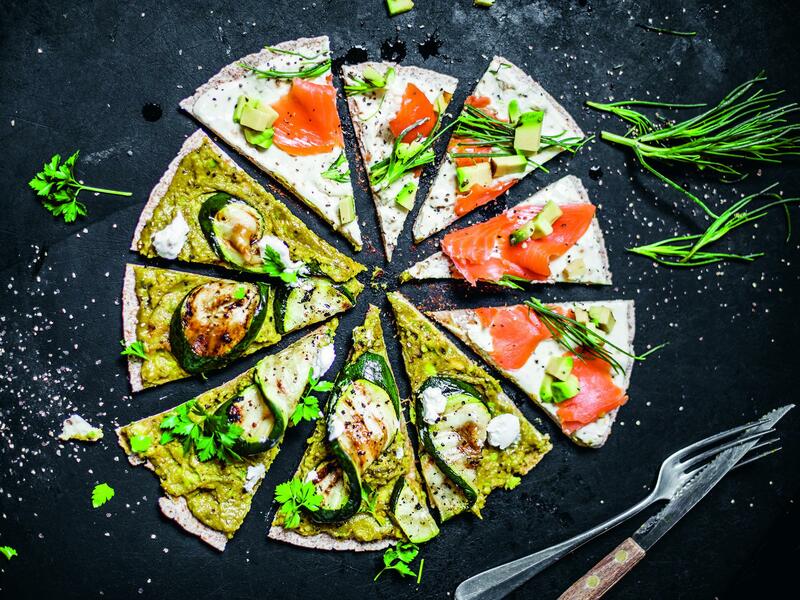 This wholewheat tortilla pizza is a great alternative to the traditional Italian pizza. It’s really easy to make, and so healthy and nourishing. Although you’re not biting into a cheesy pizza, this delicious dish gives you the same feeling. And besides that, this is a completely new taste experience. The avocado, as one of the main ingredients, brings creaminess and provides healthy fats. This pizza is ready in only 10 minutes and can be served as a main meal or starter. Mash together the avocado, cottage cheese, honey, a pinch of salt and pepper and the paprika. Spread onto the tortilla. Cut the courgette into slices, drizzle over the olive oil and season with salt and pepper. Griddle or fry the courgettes until you can see the grill marks or they are golden brown. Heat up a large frying pan, add the tortilla and fry over a medium heat for about 5 minutes until the tortilla has darkened a bit. Take off the heat and put onto a plate. Top with the courgettes, drizzle with some honey if desired, and add some goat’s cheese for extra creaminess or some grated parmesan. Garnish with fresh herbs and cut into slices. Mash up half of the avocado with the cream cheese, onion and garlic powders, salt and pepper and 1-2tsp of the lemon juice until well combined. Spread onto the tortilla. Heat up a large frying pan, add the tortilla and fry over a medium heat for about 5 minutes until the tortilla has darkened a bit. Take off the heat and put onto a plate. Dice the other half of the avocado, season with salt and pepper, and scatter over the tortilla. Tear the salmon into smaller pieces and add on top of the tortilla. Sprinkle some dill and 1tsp of lemon juice over the tortilla and cut into slices. The real pizza feeling with a flourless dough. A pizza dough without flour in it at all – how is this possible? By making the dough out of cauliflower. It might sound a little bit weird to you at first, but wait until you’ve tried it. The cauliflower base is an amazing option for you to make when you don’t want to eat carbs but still want to eat a nourishing pizza that keeps you full and satisfied. This pizza is not only delicious right out of the oven, but also served in slices as a starter or as a snack on a night with friends. Preheat the oven to 220C. To make the pizza base, grate the cauliflower, add a pinch of salt, put it onto kitchen paper and squeeze out the excess liquid. Put the grated cauliflower into a bowl and add the onion powder, garlic powder, grated parmesan and basil. Season with some more salt and pepper, if desired, and add the chilli if you want some spice. Pour in the egg and mix everything really well, then form the mixture into a ball with your hands. Line a baking tray with parchment paper and put the cauliflower “dough” on top. Cover with another piece of parchment paper and roll out the dough to an approximately 5mm thick circle. Take off the top piece of parchment paper and bake the base on the lower shelf of the oven for 30-40 minutes. Take the cauliflower base out of the oven and prepare the toppings. Cut the tomatoes into slices, halve the cherry tomatoes and quarter the figs and spread everything out onto the base. Drizzle the olive oil on top and bake for another 10-15 minutes. A few minutes before taking the pizza out of the oven, add some grated parmesan on top to melt. Take the pizza out, garnish with basil leaves, drizzle the balsamic cream on top and cut into slices. Serve right away or cool in the fridge to serve later as an appetiser. Pour the water into the bowl of a stand mixer or a medium bowl. Sprinkle the yeast over the water, and let stand until the yeast has dissolved, this takes about 5 minutes. Stir in the flour and salt to form your dough. Stir with a spatula until you’ve formed a floury, shredded dough. Using the dough hook on the stand mixer, or kneading by hand against the counter, knead the dough on medium speed until it forms a smooth, slightly sticky ball that springs back when you prod it, this will take around 5-8 minutes. If the dough sticks to the bowl then add a teaspoon of flour at a time until it’s easier to work with; avoid over flouring. No time to rise? – skip the rise and make the pizza straight away. It will make a thin and crispy crusted pizza. For a more homeslice style base, let the dough rise for 1-2 hours. Clean out the mixing bowl, coat the dough ball with a little oil, and put the dough back in the bowl. Cover the bowl with a tea towel and let the dough rise until doubled in size, 1-2 hours. Remove all the outer leaves from the cauliflower and rub heavily with the harissa paste and olive oil, roast for 20 minutes until charred and gnarly. Allow to cool before slicing. Rough chop the cauliflower florets and keep aside for later. Drain and pat dry the chickpeas, add salt, a pinch of paprika and a glug of olive oil, roast in the oven at 190C on a baking tray until firm and crisp. Combine tahini, lemon juice, water, paprika and salt in a blender and blitz until smooth, remove ¾ the quantity and reserve for your base. With the remaining mix add a little water to loosen and use this to drizzle over your cooked pizza at the end. Deseed the pomegranate, roughly chop the coriander and finely slice the piquillo peppers. Arrange a rack in the bottom third of the oven. Place a baking stone or upside-down, heavy baking sheet on the rack. Heat the oven as hot as it will go, ideal temperature is 260C. Divide the dough in half, and roll one of the pieces into a 10-inch round. Transfer the round of dough to a floured pizza baking stone or the upside down baking tray. Now for the toppings, spread an even amount of tahini base mixture around the dough, leaving enough edge for the crust. Scatter the cooked cauliflower, chickpeas and piquillo peppers all over the pizza, evenly. Bake until the crust is golden, and you see a some charred bits on the edges, this will take 5-10 minutes depending on the heat of your oven and how thick or thin you rolled your pizza. Remove from the oven, carefully. Lovingly dress with fresh pomegranate seeds, chopped coriander and drizzle with the tahini and pomegranate molasses.